Rob Newton’s maiden double century ensured Northamptonshire avoided the prospect of the follow-on against Leicestershire at Wantage Road, but the hosts will likely still have to bat out the final day to avoid defeat. Newton’s 202 took Northants to 397-7 in reply to Leicestershire’s 519, before captain Alex Wakely surprisingly declared 122 runs adrift of Leicestershire’s first innings total, the visitors progressing to 49-0 in their second innings. With a lead of 171 overnight, Leicestershire will be able to push on to a declaration on the final morning, but will face having to dismiss Northants for a second time without lead bowler Clint McKay, who hobbled off with a knee injury. For Newton, it was a ninth career century but of his previous eight the top score had been 119, against Derbyshire back in 2012, but the 26 year old breezed past that in partnerships with Saif Zaib and Steven Crook that took the follow-on out of the equation, something that had been a real threat at 184-5 early in the morning, still 335 runs behind. Having spent the past few years in the middle order, Newton was moved up to open this campaign and despite a century at Bristol as well as his double today in six Championship matches, the batsman admitted his preferred role was still in the middle order. “It’s great, the most important thing is we’ve dug ourselves out of the hole we were in and we can look to set a game up tomorrow and hopefully find a scenario where all three results are possible in the final session tomorrow,” he said. “I don’t feel like many of them [centuries] have been me throwing it away, it’s just one of those things, I had a little smile when I got to 120 knowing the lads up here would be celebrating a free pint tonight, I felt really good all day so was just a case of carrying on what I was doing. 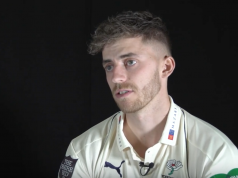 “I think that’s where the club sees me, I think I’d still prefer to bat number four, but we’ve got a lot of good players in the middle order, and I’ve proven a few times that I can make runs at the top. 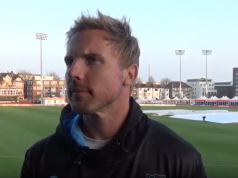 Wakely’s decision to declare on 397-7, still 122 runs adrift, caught most inside Wantage Road by surprise, including Newton, who suggested talks may have taken place to set up some sort of run chase on the final day. With Leicestershire’s promotion rivals Essex, Worcestershire and Sussex all in prime positions to claim victory in their respective matches, the Foxes may have to offer a carrot to Northants on a pitch which has shown little signs of detrition. “It took two umpires, two batsmen and eleven fielders by surprise, and I think a few of the lads up here didn’t know about it, so it had the element of surprise, but think the two captains, or at least coaches have had a little word and see if we can find some way of getting a result tomorrow. “There’s some spin and a little bit of variable bounce but more balls aren’t doing anything that are misbehaving, but it always hard to tell until you need to score at five or six an over, might see a bit more from the deck when people are going for balls we could have left all day today. Any chance of a Leicestershire declaration could be hampered by the fitness of McKay, who limped off midway through an over after tea, and looks unlikely to be able to bowl in the second innings. For Northants though, any thoughts of a run chase were firmly at the back at their minds at the start of a day where they had resumed on 142-4, with Adam Rossington making a quick 26 before edging McKay to slip with the follow-on mark still 186 runs away. But Zaib showed maturity beyond his 18 years of age in a partnership of 81 with Newton in 35 overs that killed off any chances of a Northants collapse, Newton going through to three figures whilst Zaib followed a maiden half century in Swansea last week with 43. The new ball saw him edge Neil Dexter to Ned Eckersley, who took four outfield catches to followed his 107, and when Rory Kleinveldt was run out for 12 Northants were seven down and still 74 runs short. However the injured Steven Crook, who tweaked a calf on the first day, joined Newton and batting with Zaib as his runner, blunted the visitors attack to pass the 370 mark, Newton going on to reach his double figures shortly before Wakely’s surprise declaration. Any thoughts that Wakely was aiming to roll Leicestershire over second time around proved hopeful when the hosts turned to the spin of Rob Keogh and Zaib within five overs, and as Leicestershire cruised to 49-0 with no alarms, it will be in the visitors court to decide how much of a final day chase they will set.